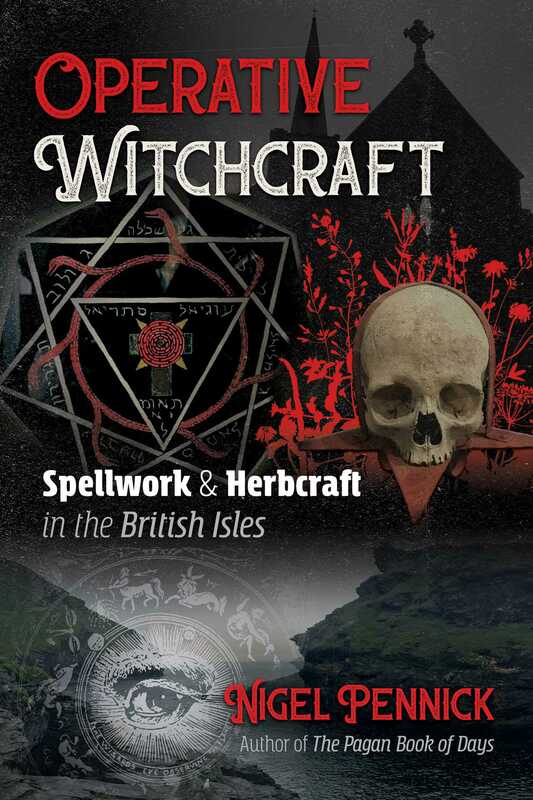 In this practical guide, Nigel Pennick takes the reader on a journey through the practice of operative witchcraft in the British Isles from the Middle Ages and the Elizabethan era to the decriminalization of witchcraft in the 1950s and its practice today. Highlighting uniquely English traditions, Pennick explores fetches and witch’s familiars, animal magic, and the forms of witchcraft practiced by rural tradespeople, such as blacksmiths, herbalists, and artisans, to enhance their professional work and compel others to do their bidding, both man and beast. He provides actual spells, charms, and folk incantations, along with details about the magical use of a variety of herbs, including nightshades, the creation of amulets and sigils, protection against the Evil Eye, and the use of aromatic oils. Pennick explains the best times of day for different types of magic, how to identify places of power, and the use of the paraphernalia of operative witchcraft, such as the broom, the witches’ dial, and pins, nails and thorns. He explores the belief in three different types of witches: white witches, who offer help and healing for a fee; black witches, who harm others; and gray witches, who practice both white and black magic. Examining witchcraft’s contentious relationship with the Christian church, he investigates the persecution of witches throughout the UK and the British West Indies up until the mid-20th century. He offers a look into the changing public perceptions of witchcraft and the treatment of its followers as well as revealing how English churchmen would offer magical solutions to the perceived threat of black witchcraft. Painting an in-depth picture of English witchcraft, including how it relates to and differs from modern Wicca, Pennick reveals the foundation from which modern witchcraft arose. He shows how this context is necessary to effectively use these ancient skills and techniques and how the evolution of witchcraft will continue harmonizing the old ways with the new. How historic witches learnt their trade is largely unrecorded. There are a number of known oral transmissions, but the overlap between what was transmitted in each case is not very large, and there is little to indicate a connected movement at any time. Because they are customarily portrayed as poverty-stricken old women living in ramshackle hovels, it is assumed that women who practised magic were always illiterate and thus not in possession of any books. But, as today, when unique old manuscripts exist in the possession of individuals, there have always been books circulating outside the remit of institutions such as universities, or, later learned societies. Because elements of pre-Christian magic and lore have been detected in recorded witchcraft practices and spells, it is often assumed wrongly that the entire corpus of practise in historic British witchcraft is Pagan. Recorded evidence shows that spells of healing especially drew strongly from Christian sources, sometimes the mainstream Bible and occasionally from apocryphal sources. In medieval times, Catholic priests would as a matter of course in medical cases perform benedictions over water to heal a man’s eyes and bless an ointment or medicinal draught before it was administered. There were graces before meals, and a benediction over ale. Priests said benedictions over weapons about to be used in warfare, blessed the plough, and said a benediction over a hunter’s nets for catching wild animals. They prepared holy water to disperse fiends. This ecclesiastical custom is not finished, for in the winter of 2010/11 the Bishop of Lincoln blessed the Lincolnshire gritting machines and snowploughs at their depot. In Gaelicspeaking Scotland, charms known as An Soisgeul - The Gospel - were sewn into clothing as a protector long after Protestantism was in the ascendancy. They consisted of a verse of scripture, a hymn or words of benediction, written by a priest. Many of these benedictions ceased when the Protestant sect became dominant, but among vernacular culture all over Great Britain, they continued, mostly unobserved by the authorities. So the tradition of saying benedictions, prayers or spells, frequently empowered by “the three holy names”, the epithets of the god of the Christian trinity - the Father, the Son and the Holy Ghost - remained embedded in traditional culture. Up sun high! Down moon low! This bruise will be quite well very soon! “Charm for Obtaining Love and for Success in all Undertakings: Whoever wears this charm, written on virgin parchment, and sewn up in a small round silken bag continuously over the heart, will obtain all the love he or she may deserve and will be successful in every undertaking” (Hewett 1900, 74). “Charm for Protection from Enemies: This talisman should be made from pure cast iron and engraven at the time of the new moon. Before suspending it round the neck fumigate it with the smoke of burnt spirits of Mars (a mixture of red saunders, frankincense, and red pepper), or a ring of pure gold might be made, with the characters engreven on the inside. The size and form of the talisman is immaterial so long as the proper time for making it is observed and the prescribed incense is used before it is worn. In any form it will protect one from enemies, and counteract the power of the evil eye!” (Hewett 1900, 73-74). The talisman bears the Christian sigil chi-rho, the lower arm of which is in the form of an anchor. Around it is “vince in hoc” - “conquer in this [sign]” - and the sigil of Mars. Another instance of Christian sigils used in witchcraft in England, a direct parallel with folk-magic traditions in mainland Europe and the hoodoo practitioners in the United States. The formula Abracadabra is the most widely known and immediately recognizable magic word. A prescription for its use, as a talisman against fevers, is said to come from the third century CE Roman physician Q. Serenus Ammoniacus who directed it to be written in the form of an inverted triangle, each line losing the final letter until there is but a single A.
Sarah Hewett recounts how this talisman of Abracadabra was given by a white witch to a person who desired to possess a talisman against the dominion of a grey witch, pixies, evil spirits, and the powers of darkness. It was written on parchment and enclosed in a black silk bag one inch square. The owner was told that if it should ever touch the ground, it would lose its power.